Japanese food cases, they are a thing of wonder! Nothing shows Japan's unrelenting love for the Apple iPhone like slapping a dead-on accurate recreation of a staple national food meal meticulously crafted out of TPU gel! Previously, we've shown you no less than two round-ups of food cases made for the old, but not forgotten iPhone 5s, so we're delighted to present you with the same gooey goodness re-imagined for the iPhone 6! Yes, we know, the iPhone 6 is old news as the iPhone 6s in rose-gold is the coolest kid around the block right now. But the Japanese food case industry is yet to introduce 6s models. This will inevitably happen, just not in this time and place. So, without further ado, feast your eyes and other digestive organs with the savory slideshow below. We can't wait to discover more of these appetising creations out of Japan! Pizza, egg sunny side up, hot dog, a cookie, and what else is there? Yum! According to the blurb, all food accessories are handmade and the color is lifelike. 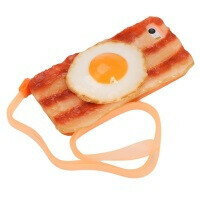 Not only does the case look cute and delicious, it will also do a decent job protecting your iPhone from harm. The price is just $12, which is pretty cheap for a meal, err, case prepared by hand! This one fits only the iPhone 6, but it makes up for that with an overload of sizzling bacon! Everyone loves bacon. Your vegetarian cousin lvoes it too, even if they are in complete denial! Anyway, this case of bacon and wonder is also made of soft TPU gel, which is prone to giving off a stale odor when initially unboxed, so be prepared beforehand. The $12 package contains a stylus and screen protector, in addition to the porky goodness. But mind you, that stylus certainly isn't of the type the late Steve Jobs would have been enthused of! Woah, look at all that rice! Incredible, but this thing really seems to be made out of soft TPU gel and not from actual field-grown rice! However, any questions you may have about this case probably revolve around the struggling orange creature in the middle. This is a... seriously, we have no idea. But it has a face! Anyway, odd-ness aside, this looks like a perfectly functional clear plastic case. But the abundance of TPU might give off a strange odor during the first few weeks! The price is about $11 with shipping. Seriously, just look at this one! It looks so real, it's actually making us salivate! The food depicted here is a sort of dumpling — Guyoza — and there are 6 pieces of it in the set. The dumplings are filled with ground meat and vegetables and wrapped in a thing dough. They originated in China, but have grown very popular in Japan. The depiction here is so realistic, you can actually see the filling and the crunchy edge from the piece that was left bitten off. The price for this beauty is a stomach-churning $93 sans shipping, though. Now his looks like a familiar affair - just some caviar spread over rice. It certainly looks very appetizing, and it seems hilarious in actual use! Great stuff, Japan, keep it coming! Unfortunately, the case is quite expensive at $36. Some f**king quality article. "Could" exist, wtf. #4 looks delicious. They "could" exist, but I'm pretty sure the 6/6 Plus cases will work for the 6s/6s Plus even if the latter is ever so slightly bigger in dimensions. i want a S6 Version of #1 !! The orange creature is Gutetama, one of many mascots created by Sanrio. Hope this helps! These aren't strange things when you are talking about JAPAN.